Ford has had a long and successful partnership with EAA AirVenture in Oshkosh, WI, sponsoring the event and exhibited vehicles in the Ford hangar. For the last six years they have also auctioned a one-off Mustang, donating hundreds of thousands of dollars to charity. Previous year’s themes for the custom Mustangs have included the SR-71 Blackbird, Blue Angels, the Red Tails, and the USAF Thunderbirds. 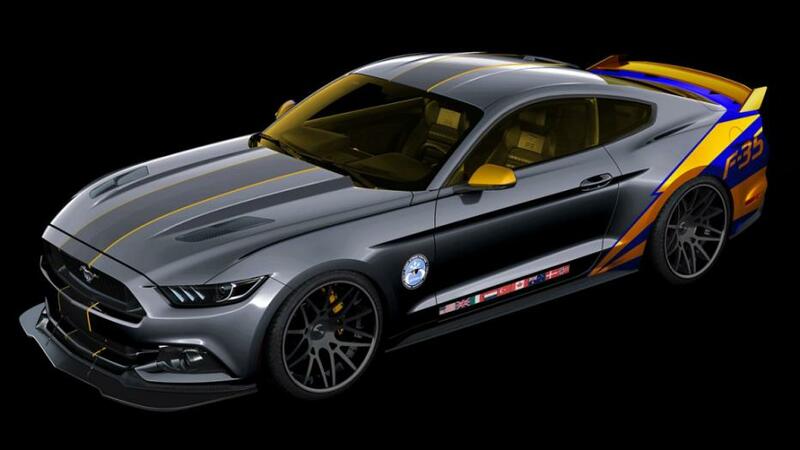 This year looks to feature a very special car as well, as Ford is building a special 2015 Mustang inspired by the Lockheed Martin F-35 Lightning II. The car features a glossy and matte titanium paint scheme with blue and yellow accents, carbon fiber front splitter, rear diffuser, Recaro seats and various F-35 Lightning II design elements both inside and out. The car will be auctioned off at the Gathering of Eagles charity event at EAA AirVenture, with the proceeds being donated to the EAA Young Eagles program. The nonprofit has provided free flights to nearly two million young people since 1992, creating a new generation of aviation enthusiasts and innovators. This entry was posted in Car Models and tagged Auction, Ford, Mustang, mymotorways, Special Ford. Bookmark the permalink. You do have a gift when it comes to writing. Outstanding article.